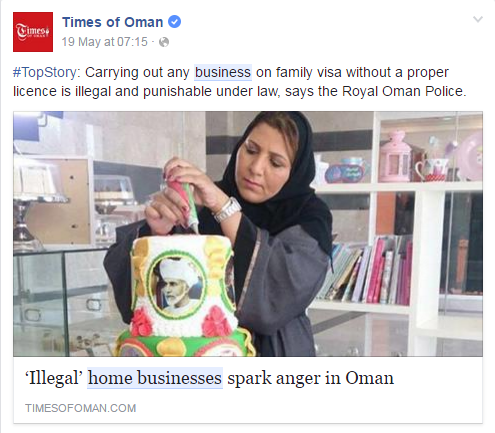 About a week and a half ago, the Times of Oman published an article which was about 'illegal' home businesses being the source of anger for some people here in Oman. The article carried the picture in the above shown screen shot, which has now been removed from the ToO website. Now its obviously not going to take a rocket scientist to realise that people (predominantly expat wives) who are making and selling items from their homes are probably breaking the law here. Meaning, to work here, as an expat, you need to be employed and hold a visa and all the rest of it. It's a pretty pointless to defend these people who are operating a home business here in Oman because fundamentally it's illegal. The cover picture to the story was of a 'local entrepreneur' decorating a lovely looking cake which features none other than HM - very patriotic. She is quoted as saying (quite rightly I also add) that it is illegal to operate a home-based business here that isn't licensed. She is then quoted to say, "there are no health and safety regulation, whereas we have to pay taxes. 12 per cent of our profits go to the Government." And this is why I do agree with her, because these home bases businesses generally don't pay tax - I mean, if you're selling cakes for a living, you're probably not clearing more than RO 50 a month in profits, and even then only if you're super busy. Realistically, your're probably making less profit than that a month, what is the cost of policing this versus the tax revenues (or fines) potentially gained? Moving back to the problem of people working "illegally" in home-based businesses - what happens at all of these car-boot sales and farmers markets when people sell their wares there? What about when people put things up for sale on OLX or other places (like the old Al Fair notice boards, or in The Week, or on Muscat buy and sell). My point is, people have been selling stuff directly to people outside of licensed businesses in Muscat for a long, long time. Shouldn't there be some sort of legislation to govern this market? I think Omanis don't like expats doing it, but they do it;) too. I know a lot of unregistered Omani housewives (and they have to be registered legally--and they aren't supposed to if they have above a certain income---they need to rent a commercial property then) doing out of their homes businesses. If you look at what these 'Home Businesses' are doing, they are providing goods and services that the Omani business owners cannot supply, due to the lack of expertise & knowledge of the product wanted. Besides which, the expats don't always want the locally produced items. They want what they are used to and are familiar with. That is why they will support the 'home style' businesses. To the lady who has complained about these home businesses, I say this: Make western style items, make a good quality product, give us variety in all forms, be it baking, clothes, craft items, etc and the number of home businesses will decrease and it will stop the home business owner from going underground and continuing their business by word of mouth. Create an environment whereby competition is encouraged due to the quality and variety of items on offer, get the various Ministries to broaden their horizons with a little bit of "Out of the Box" type thinking and allow home business to flourish, (get them registered for a nominal fee per year? )and watch what happens? But there again, you will still get the selfish narrow minded few who want to dominate the market with their goods only, not realising or not caring that competition is good for one's business and thinking that we all want the same thing. We Don't! The same lady in this article would have no issues providing you with a Simpsons, Star Wars or Disney birthday, yet not pay a baiza in royalties to the copyright holders. Potential objections aside: we phoned and asked for one. No problem! But all these people have to do is become friends with each new client and then it is alright. The lady in the picture, as shown at the start of the article, has conveniently forgotten that she started her own business making cupcakes from her own home! She now has 3 branches of this business in which she takes no part. She has employed un-interested workers to run her business, who show no interest, no new or fresh ideas in cupcake decoration. What she should have done is contacted the lady who intimated that she could do the item in questio,n is contacted her privately and commissioned her to make the required cake and paid her a commission to do so, insted she got on her high horse and now you have people doing their "home business" through private FB pages and word of mouth.